Get Started! The application process should take around 10 minutes. Your new membership includes a regular savings account, along with an optional free checking account and many other benefits we will cover later. I am a current Member of Redwood Credit Union. All RCU Members are required to establish a Regular Share savings account, which represents your share in the Credit Union. Balances under $75.00 are subject to a monthly minimum balance fee. Please see our Cost Recovery Schedule and our Truth in Savings Disclosure for further details. All Overdraft Protection Services - I authorize RCU to pay my overdrafts on checks, electronic (ACH) and recurring debit card transactions, and everyday debit card transactions. Checks and Electronic Transactions Only - I authorize RCU to pay my overdrafts only on checks, electronic (ACH) and recurring debit card transactions. I do not authorize RCU to pay my everyday debit card transactions. No Overdraft Protection Services - I do not authorize RCU to pay my overdrafts on checks, electronic (ACH) and everyday debit card transactions. I understand that non-sufficient funds (NSF) fees would apply. Save time and typing ! 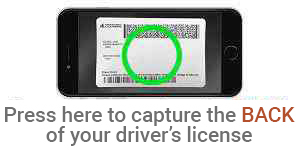 Take a photo of the barcode on your current identification if there is one available. No barcode ? Close this window to continue. I understand the IRS does not require my consent to any term of any agreement with Redwood Credit Union except the certifications required to avoid backup withholding. I certify under penalties of perjury that (a) the Social Security Number or Employer ID number shown is my correct U.S. Taxpayer Identification Number, (b) I am a U.S. person, and (c) I am not subject to backup withholding because (i) I am exempt from backup withholding, or (ii) I have not been notified by the Internal Revenue Service that I am subject to backup withholding as a result of a failure to report all interest or dividends, or (iii) the IRS has notified me that I am no longer subject to backup withholding. I am NOT subject to backup withholding.I am subject to backup withholding. By checking this box and clicking the “I agree” button below, you authorize us to verify the information you submitted and to obtain your credit report to determine if you qualify for Membership and other RCU products or services, and to manage any loans you may have at RCU. Upon your request, we will tell you if a credit report was obtained and give you the name and address of the credit reporting agency that provided the report. You warrant to us that the information you are submitting is true and correct. You understand that account applications for minors must be completed and submitted by an adult who will be a joint Member on the account and certify that you are over 18 years old.